Every week I’m more and more convinced that Cristina and I were made for each other. She seems to have the same philosophies and views to the world. I know our coordinator, Gloria, spends time trying to match the tutor to the student. I cannot thank her enough for that investment in us and getting it right. Each session with Cristina now starts with one hug, two smiles and recaps of our week. At this point in our journey, I don’t always remember what we cover because the conversations are so effortless. We ease into new topics like we are at the local coffee house and have known each other for years. I do recall Cristina talking about ‘time’ at the beginning of our session. It stands out in my mind because I collapsed into my easy chair and absorbed her thoughts in near disbelief. She discussed not rushing and being present in the moment. She talked about the value and preciousness of time. She sounded so wise for someone so young. Many things she said I’ve only recently learned. I only added that I don’t wear a watch for many of the reasons she mentioned. I also admitted that our library time, being at a set hour each week, is a routine I love but I am not a person of routine. Our time discussion led to talking about retaining the playfulness of a child. She used ‘puddles’ for an example and I admitted that I still like to jump in them. I told her of a time my parents babysat. When we got home, my mother apologized for the girls messy clothes because my father had played in the storm puddles with them. I told my Mom it was okay. I thanked my Dad. I wanted that for them. We discussed a coming of age movie that we had both seen. Cristina had a book with her and told me she liked reading about Medeival times – books like Ex-caliber. 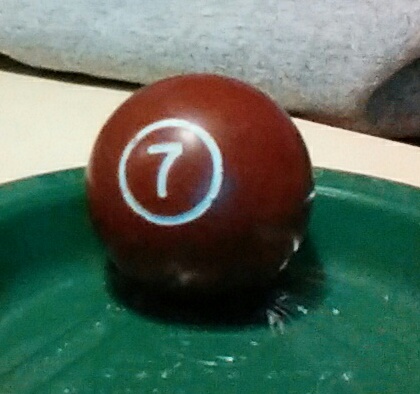 We had to wait for our reserved room but before we walked in, Cristina told me about the number seven. It has a lot of significance for her, especially recently. Seven gifts. July 7. Seven colors in the rainbow. 4-2-1, the address in the movie she’d watched too! I should have told her that whenever I pump gas, I make sure the total sums to seven. We spent our remaining time looking at a map and giving each other directions: down, first right, second left, follow, next to, points of reference. We learned from the streets of our paper city. – I don’t mind if our time together goes well over the planned hour. – Cristina makes me feel younger and happy. – She pulls me in the right direction in this world. – We are together at 7:00 on Thursday night’s. Wise Cristina’s blog includes music, movie reviews and some of her views on life. Previous PostThe FlightNext PostWhat has inspired you today?